An N2UW research plane flies over the Pioneer Fire smoke plume. According to the plane’s instruments, it had been seized by an 80 mph updraft of hot, buoyant air, followed by a turbulent downdraft. It was “the strongest updraft I’ve ever flown through,” says Kingsmill, a precipitation and radar scientist at the University of Colorado in Boulder. Even stronger forces were at work several thousand feet below: The plane’s radar waves, reflecting off rising smoke particles, had registered updrafts exceeding 100 mph. Hundreds of miles away, Kingsmill’s research partner, Craig Clements, a fire meteorologist at San José State University, watched the plane’s flight path creep across a map on his laptop screen. 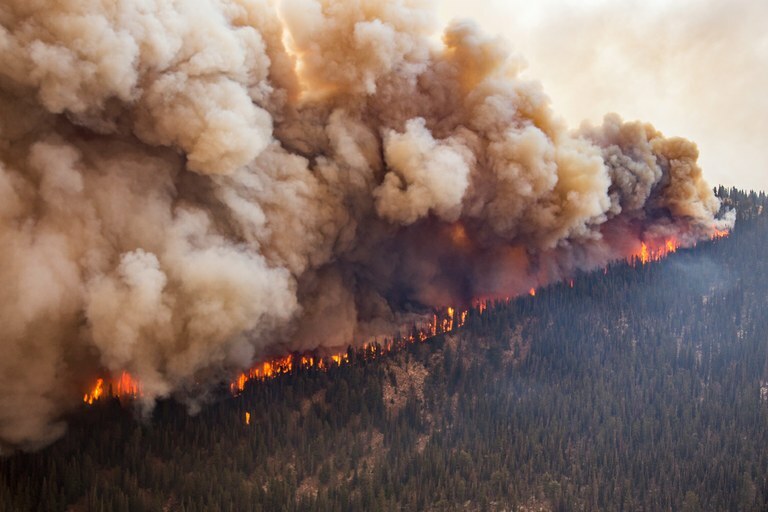 The unfolding drama offered a tantalizingly detailed glimpse into the anatomy of an extreme wildfire. “It’s amazing,” says Clements. “We’ve never seen this kind of structure in a fire plume, ever.” For decades, scientists have focused on the ways that topography and fuels, such as the trees, grass or houses consumed by flames, shape fire behavior, in part because these things can be studied even when a fire isn’t burning. But this line of inquiry has offered only partial answers to why certain blazes, like the Pioneer Fire, lash out in dangerous and unexpected ways — a problem magnified by severe drought, heat and decades of fire suppression. A mere 1 percent of wildfires account for roughly 90 percent of the land burned each year in the Western United States. Some of these fires “really are unprecedented,” says Mark Finney, of the U.S. Forest Service’s Missoula Fire Sciences Laboratory. Their behavior “is particularly threatening because we don’t have a good way to anticipate or predict (it).” So Finney, Clements and a handful of others are increasingly turning their gaze to fire’s invisible and diaphanous incarnations: the hot, roiling gases and smoke swirling among the flames, and the rising plumes they coalesce to form. There, they believe, lies the key to understanding the way a wildfire breathes — roaring into conflagration with bigger gulps of oxygen or sputtering along more slowly on little sips. How it moves, spawning lethal fireballs or hurling burning logs ahead of the flames. The way it grapples with the upper layers of the atmosphere, sending embers in unexpected directions to propagate itself across the land. Even, perhaps, the role its elemental opposite — water —plays in driving its explosive growth. Nailing those connections could provide new tools for monitoring fires and predicting their behavior. This could give firefighters precious minutes of advance warning before potential catastrophes, and better inform the difficult decision to order an evacuation. But it won’t be easy. “The plume is orders of magnitude harder to study than the stuff on the ground,” says Brian Potter, a meteorologist with the Pacific Wildland Fire Sciences Laboratory in Seattle who sometimes works with Clements. Indeed, it took a global conflagration much darker than any forest fire to even begin laying the foundations of this work. Kingsmill’s observation about the bomb, it turns out, isn’t far off. The evening of July 27, 1943, was stiflingly hot in Hamburg, Germany. The leaves of oak and poplar trees hung still in the air as women and teenagers finished factory shifts and boarded streetcars. They returned home to six-story flats that lined the narrow streets of the city’s working-class neighborhoods. They opened windows to let in cooler air, and folded themselves into bed. It was nearly 1 a.m. when British planes arrived. Searing yellow flares drifted down over the city, dropped to mark the city’s eastern quadrant as that night’s target. Bombs followed, tearing open buildings and exposing their flammable contents to a rain of incendiary canisters that hissed as they fell. Thousands of small fires sprang up. Families retreated into basements. The buildings above them roared into flame, and these growing fires greedily sucked air from their surroundings. Their collective inhalation drew winds through the narrow urban canyons, pulling along embers that ignited yet other buildings. Within minutes, the fires were merging. A model German apartment building goes up in flames during a test of the M-69 incendiary bomb in the 1940s at Dugway Proving Ground, in Utah. A Lancaster plane flies over Hamburg, Germany, in 1943. On the night of July 27, 1943, more than 700 planes dropped bombs that started the Hamburg firestorm. An aerial view shows ruined buildings in Hamburg, Germany, after the bomb-induced firestorm, in July 1943. The British historian Martin Middlebrook has collected the accounts of survivors who dampened their clothing, fled their bunkers and crawled through the streets. They described the inflowing winds as “shrill,” “shrieking” and “howling” — the scream of “an old organ in a church when someone is playing all the notes at once.” Gales exceeding 110 mph uprooted trees, pushed struggling full-grown adults deeper into the fire zone, and sucked babies and elders into burning buildings. The winds swirled into flaming tornadoes that swept up people and turned them into “human torches.” Balls of fire shot out of buildings. Within 60 minutes, a spiraling pillar of smoke had swelled into an anvil-shaped thunderhead that towered 30,000 feet over the city. Such cataclysms had occurred before. Fires destroyed London in 1666, Peshtigo, Wisconsin, in 1871, and San Francisco following the 1906 earthquake. But Hamburg might have been the first time that people intentionally created a firestorm, with chilling calculation. The British chose to bomb that section of the city, not just to demoralize the workers in Germany’s critical U-boat industry, but also because of the tightly packed buildings that covered 45 percent of its ground area. And their tactics were almost certainly influenced by experiments begun four months earlier, across an ocean and half a continent, on a remote desert playa in northwest Utah. There, the U.S. Army’s Chemical Warfare Service had commissioned Standard Oil Development Company to construct a row of steep-roofed European-style apartment buildings. Erich Mendelsohn, an architect who had fled Nazi Germany, specified every detail: 1 1/4-by-2-inch wood battens, spaced 5 7/8 inches apart, to hold the roof tiles; 1-inch wood flooring underlain by 3 1/2-inch cinderblocks, and so on — all to replicate the dwellings of German industrial workers. The wood was maintained at 10 percent moisture to mimic the German climate. Rooms were outfitted with authentic German curtains, cabinets, dressers, beds and cribs — complete with bedding — laid out in traditional floor plans. Later, scientists studying urban fires during the Cold War noticed something that underscored this finding: When a fire plume rotated, the rate of burning seemed to increase on the ground. It suggested that rotation lessened the drag between the plume and its surrounding air, allowing it to rise more strongly and pull in fresh oxygen more effectively on the ground. Fire is so universally familiar that we take for granted that we understand how it works. And yet these old experiments, finished by 1970, are still a key source of knowledge about extreme fire behaviors. Until recently, technology was simply too limited to reveal much more about the specific mechanisms by which a fire plume might feed a firestorm, let alone how beasts like fire tornadoes and fireballs form. Scientists needed new ways to see within the smoke and turbulent flames — to make the invisible visible. And as it happens, they began finding them almost by accident. One morning in February 2005, Craig Clements watched as a 6-foot wall of flame crept across a prairie a few miles outside Galveston, Texas. He was not yet a fire scientist; in fact, he was slogging through his seventh year of graduate school, studying a completely unrelated topic — mountain winds. This was just a side project, a favor he was doing for his Ph.D. advisor at the University of Houston, who had a steel weather tower in the field. A prescribed fire had been planned there to prevent fuel buildup that could cause a more serious blaze. What would happen, they wondered, if they mounted extra instruments on the tower to measure the winds, heat and gases released by the fire passing directly beneath it? The results were stellar: Clements’ sensors showed that the flames produced a surprisingly strong pulse of water vapor. Clements abandoned his previous line of study and landed a faculty job at San José State University in 2007, where he continued his research. His instrument towers, deployed in carefully controlled fires, provided yet more unprecedented and precise measurements: how winds accelerate and draft into an advancing flame front, the heat and turbulence above the flames, and the speed of the rising hot air. Still, dangerous behaviors like fire tornadoes, or lofting of embers, usually happen in much larger fires than experiments can replicate. And the plumes of those fires rise thousands of feet. Clements was capturing the action only within a few feet of the ground. And he was just getting point measurements — like following a single bird to understand the movement of an entire flock wheeling in the sky. Clements wanted to capture the whole phenomenon — to look inside the opaque mass of an entire fire plume from a distance, and see all of its parts swirling at once. In 2011, he found his lens: a technology called Doppler lidar. Unlike the Doppler radar that police use to measure the speed of passing cars, lidar is tuned to detect reflections of its low-powered laser off particles smaller than red blood cells. It actually scans the sky, collecting thousands of pinpoint measurements per second, which can be reassembled into a picture of both the plume’s surface and its internal air currents. Clements and his postdoctoral student, Neil Lareau, mounted this television-sized gadget in the back of a pickup truck and hit the road in search of wildfires. In June 2014, live ammunition fired during an Army training exercise afforded them the chance to watch a fire roll through 4,800 acres of grass and oak hills at the Fort Hunter Liggett training ground in California. They watched through lidar as a rotating column of smoke stretched, narrowed, and accelerated into a fire tornado two football fields across, with winds swirling 30 mph. These tornadoes, or “whirls,” can pose sudden dangers in wildfires. During a 1989 blaze near Susanville, California, a powerful whirl raced out of a flame front, with winds estimated at 100 mph. Three fire engines retreated just in time to escape being torched, but four crewmembers were hurled into the air — all of them seriously burned. The Bald and Eiler fires in Northern California were only 10 miles apart, but they traveled in opposite directions, different than what could be predicted based on just the wind. For now, fire whirls are nearly impossible to predict. But that afternoon at Fort Hunter Liggett, Clements and Lareau began to get a sense of how they form. It was an eerie and beautiful process, hidden deep inside the smoke column. First, an embryonic disturbance in the fabric of the plume: Hot rising gases began to rotate with the motion of an air current coming from the side. This vague motion coalesced into two small, separate whirls. They circled around one another like dancing, swaying cobras preparing to mate, then merged into a single powerful vortex. “The laser is seeing through a lot of the smoke,” says Lareau. “It’s showing you something that you can’t necessarily see by the naked eye about what the fire is doing.” If firefighters had access to similar technology, they could potentially recognize an impending whirl in real time before it forms, and escape. A month after Fort Hunter Liggett, Clements and Lareau stumbled onto another discovery at the 17,000-acre-and-growing Bald Fire, north of Lassen Volcanic National Park in California. On a warm, hazy morning, the pair sped in their pickup truck along Highway 44, south of the fire, looking for a good vantage point for seeing the plume. From the bed of the truck, their lidar and radar wind profiler pointed straight up at the sky, recording the smoke, winds, and clouds directly overhead. Then the highway began to gradually descend down the slope of the volcanic plateau where the fire burned, and they noticed something strange. Even as the winds thousands of feet up blew north, the smoke just below those winds was drifting steadily south. They spent the rest of the day following the broad mass of smoke as it oozed 20 miles downhill, like a gauzy, viscous lava flow in the sky. During that drive, they downloaded weather and satellite images of the broader smoke plume from both the Bald Fire and the similar-sized Eiler Fire, 10 miles to the southwest of it. A surprising picture emerged. Smoke from the Bald Fire had shaded broad swaths of the landscape — cooling the ground, and several thousand feet of air above it, by a few degrees. Even as the winds blew north, this cool, dense air was rolling downhill like molasses, pushing under the winds as it followed the contours of the land — carrying a layer of smoke 6,000 feet thick along with it. “We had no idea we were going to see things like that,” says Lareau, who now holds a faculty position at San José State University. “It seems like every time we go, we end up with new perspectives.” The team’s insight about the Bald and Eiler fires has implications for predicting smoke and air quality — a constant concern for communities near large fires. It also impacted the fires themselves. Even though both fires existed in the same atmospheric environment of pressures and winds, and burned across similar terrain, they were spreading in opposite directions that day — Bald to the south, and Eiler to the north. This denser current of cold air and smoke was actually pulling the Bald Fire in the opposite direction of what was predicted based on wind alone. Clements imagines a future in which lidar is not simply a tool of research, but also standard equipment mounted with automatic weather stations on fire trucks. This device would theoretically be much smaller and cheaper than current technology. It scans the plume continuously to obtain real-time data, which “is then uploaded into a mainframe computer that’s running a fire-weather model,” says Clements, “and boom, problem solved.” The fire crew would receive a fire-behavior forecast that reflects detailed information about a plume’s evolving structure — something not currently possible. That forecast could warn about impending events, such as a strengthening updraft that might conspire with winds higher up to toss embers into unburnt areas, or an incipient plume collapse that might splash the fire and hot gases in unexpected directions. Yet even in its ideal form, that bit of technology wouldn’t be able to forecast everything: Some extreme fire behaviors are driven by smaller-scale forces that even lidar can’t capture. Scientists suspect these might be responsible for some of the more tragic firefighter deaths in recent years. 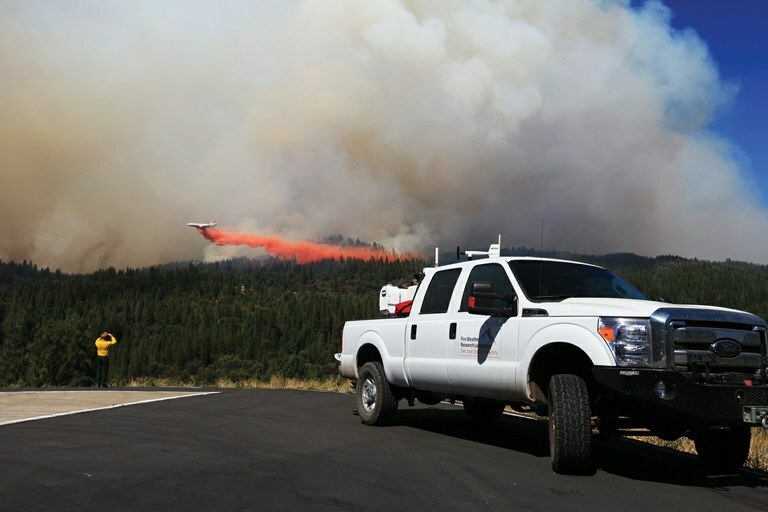 A plane spraying fire retardant passes near the plume of the 2014 King Fire in California while a lidar machine on a truck scans the smoke. The South Canyon Fire hardly seemed threatening at first. Lightning started it on July 2, 1994, atop a ridge overlooking Interstate 70, a few miles west of Glenwood Springs, Colorado. It crept at a civil pace down the mountain’s slopes, through dry grass and Gambel oak. Then, around 3 p.m. on July 6, a cold front swept over the area, spawning winds that pushed the lower part of the fire across the mountain’s southern face — igniting the base of an unburned drainage. The fire crew working there may not have realized their peril until too late. Fourteen firefighters were crossing the drainage as the fire entered its lower reaches. The flames quickly gained on them as they hurried diagonally across it, toward the ridge top, following a firebreak through the dense vegetation that they had cleared the day before. Firefighter Kevin Erickson, a couple hundred feet in front of the others, glanced back to see a wall of flame advancing up the sides of the gully before he crested the ridge and scrambled down its other side. Firefighter Eric Hipke was 45 seconds behind him. His pace quickened as the heat grew unbearable. Several steps short of the ridge top, a blast of searing air struck him from behind. He slammed to the ground with a yell, then scurried to his feet, shielding his face from a maelstrom of smoke and flying embers, and sprinted over the top. Hipke was the last person to reach the ridgeline alive. Only later did he realize that his backpack’s shoulder straps had melted through, leaving it bobbing from his waist belt. He sustained third-degree burns across the back of his arms, legs, torso and head. The bodies of the 12 remaining crewmembers were found that evening. (Two from another party, who died in a separate part of the blaze at the same time, were found July 8.) Hipke’s crew was strung out along the path they’d been following, some with their backpacks still on — as though overcome, simultaneously, by a sudden force. Observers have speculated for years about what, exactly, killed them. The fire may have overtaken them or a gust of wind may have pushed the hot gases of the plume down onto them. In the years since, however, scientists have uncovered another possibility — a type of blowup that may have caused multiple fatalities over the years, but left no survivors to describe what happened. Like Clements, Janice Coen stumbled onto these questions by accident. Coen works at the National Center for Atmospheric Research in Boulder, Colorado, where she studies fire’s inner workings. In September 1998, she spent several hours aboard a Hercules C-130 aircraft as it circled over Glacier National Park. The McDonald Creek Fire was marching up a steep slope at roughly three feet per second. Its smoke obscured the advancing flames, but infrared video cameras mounted outside the plane recorded what was happening underneath. It was only later, as Coen looked through individual frames of that video, that she noticed something strange: At one point, a jet of flame seemed to shoot ahead of the fire. It lasted only a second or two, but left a trail of newly ignited vegetation in front of the fire. Not until Coen calculated the size of the pixels and the time between frames could she appreciate its true significance. The jet had surged 100 yards ahead of the fire’s front, advancing 100 mph — “like a flamethrower,” she says. It was 10 times faster than the local wind — generated, somehow, by the fire’s own internal tumult. Coen called it the “finger of death,” and for her it brought to mind the unconfirmed reports of fireballs that occasionally circulated among firefighters. She had never seen such a thing, but as she examined footage of other fires, she was surprised to find fire jets again and again. Her infrared videos were in some ways akin to those classic blurry clips of Sasquatch walking in a forest — a strange and fleeting embodiment of fire’s turbulence, without clear explanation for its existence. In his lab experiments, Finney used high-speed cameras to watch what amounted to miniature forest fires: walls of flame advancing through hundreds of cardboard “trees” the size of matchsticks. The advancing flame front resembles a jagged-toothed saw blade at any given instant, with interspersed high and low points, flickering several times per second. But slow it down, watch a single one of these high points, and you begin to perceive something more complex. The flickering peak of flame repeatedly curls over on its side, like a surfing wave in Hawaii, viewed edge-on as it rolls into a pipe and crashes on itself. This churning wave of flame rolls over and over, staying in roughly the same place. It is a horizontal, rolling current, driven by the constant push and pull of gases within the fire. Combustion gases heated to 1,800 degrees Fahrenheit are only one-quarter as dense as ambient air — a difference that makes them more buoyant and causes them to rise, creating the flickering peaks of flame. 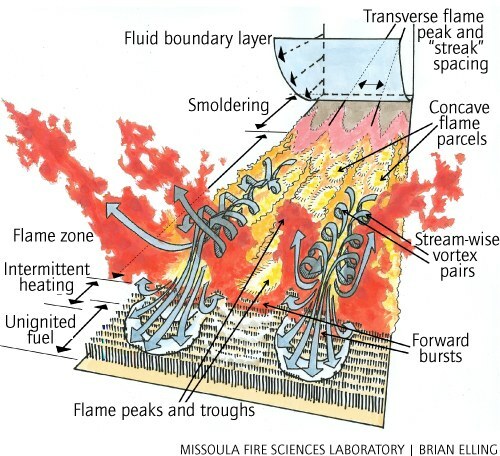 Cooler, denser gases rush downward to fill the void, driving the downward side of the rolling current and pressing down on the fire to create low spots in the flame front. Finney’s slow-motion videos show that these rolling eddies exist in pairs within the fire. They roll in opposite directions, coupled like interlocking gears. Their combined motion periodically pushes down on the advancing front of the fire, causing flames to lick downward and forward, ahead of the fire. Finney believes that these forward flame-licks are scaled-down versions of the “fingers of death” that Coen has seen in wildfires — possibly even related to the fireballs said to have shot out of buildings during the 1943 Hamburg firestorm. Coen has actually documented similar flame-rollers in real wildfires using infrared video. But she believes that the finger of death also requires another factor. As bushes and trees are heated by an approaching fire, their decomposing cellulose releases hydrogen, methane, carbon monoxide and other flammable gases in a process called pyrolysis. Coen and Shankar Mahalingam, a fluid-dynamics engineer at the University of Alabama in Huntsville, believe that rolling currents can mix these flammable gases with oxygen-rich air. “The dangerous situation is when the fire is going up on a hill,” says Mahalingam. “Maybe there are pyrolysis products that have accumulated” in front of the fire and mixed with fire-boosting oxygen. As the flame licks forward into this invisible tinderbox, it ignites a blowtorch. Reflecting back on the South Canyon Fire in 1994, it is tempting to wonder whether the same blast that flattened Hipke near the ridge top also killed the 12 firefighters behind him — one of them just 40 yards back. Some have even speculated that Hipke would have died along with them — his lungs seared by hot combustion gases — had he inhaled rather than yelled as he fell to the ground. Coen sees the South Canyon tragedy as one of several likely caused by the “finger of death” — a monster created by the turbulent respiration of the fire itself and the violent rise of its hot, buoyant gases. These same buoyant gases also supply the momentum that drives a fire whirl to spin once it is triggered. And on a much larger scale, they are what pushes a fire plume ever higher in the sky, powering the in-drafts that keep the fire burning below. But the source of the speed and energy with which these gases rise is still the subject of intense speculation. Potter, of the Pacific Wildland Fire Sciences Laboratory, has found some surprising possible answers. They arise, in part, from some of those old military fire experiments — these particular ones conducted in the aftermath of World War II by a U.S. government that feared the devastation of Hamburg might represent the future of modern warfare. In 1967, workers with the Forest Service and the Department of Defense stacked 342 piles of juniper and piñon logs in this place — 20 tons of wood per pile, spaced 25 feet apart. Then, at 8 a.m. on Sept. 29, they set fire to them. Project Flambeau comprised some two-dozen experiments like this one, meant to simulate an American suburb under nuclear attack — specifically, the many small fires that would merge into a storm, as happened not only in Hamburg, but also Hiroshima and Nagasaki. Lengthy reports describe how helium balloons released near the fire here rose several hundred feet, then swooped down into the flames, revealing strong downdrafts feeding the fire from its sides. But what drew Potter’s interest was the water. Concentrations of water vapor rose 10 to 20 times higher than the surrounding air. Water is a major product of combustion, second only to carbon dioxide. It forms as oxygen binds to the hydrogen atoms in wood, gasoline or just about any other fuel — creating hydrogen oxide, otherwise known as H2O. Burning four pounds of perfectly dry wood releases a pound or two of water. Exhale onto a car window and you will see another form of the same phenomenon, fogging the glass: water produced from the oxidation of food you have eaten. This vapor is familiar and mundane; it hardly seems like a violent force. Potter wondered if the water vapor released from combustion might infuse extra energy into wildfire plumes. By condensing and giving off heat, it might allow some plumes to rise higher and faster, accelerating the fire on the ground. Through a bit of serendipity, this theory actually led to Clements’s first fire experiment — the prescribed prairie burn back in 2005. It was Potter, who happened to know Clements’ Ph.D. advisor, who suggested it. Neither the results of Clements’ experiment nor those of Flambeau were conclusive about the importance of this pulse of water vapor. Still, some people have latched onto the theory. Michael Reeder, a meteorologist at Monash University in Australia, is one of them. He believes that water was pivotal in fueling the firestorm that swept through the suburbs of Canberra, the Australian capital, on Jan. 18, 2003. The fire consumed 200,000 acres of drought-stricken territory that day, isolating the city under a glowing haze of Halloween orange. Remote infrared scans suggest that during a single 10-minute period, it released heat equivalent to 22,000 tons of TNT — 50 percent more than the energy unleashed by the atomic bomb dropped on Hiroshima. A series of four pyrocumulonimbus clouds rose into the stratosphere that afternoon. These fire-fueled, anvil-shaped thunderheads lofted black, sooty hail up to six miles away. One of them spawned a tornado that snapped the tops off pine trees as it plowed a path of destruction 12 miles long and a quarter-mile wide. Combustion provides a plausible source for it. Reeder estimates that the fire incinerated over 2 million tons of wood and vegetation that day, liberating at least a million tons of water vapor into the sky. The temperature and density differences that drive such cataclysmic power can seem deceptively minuscule. 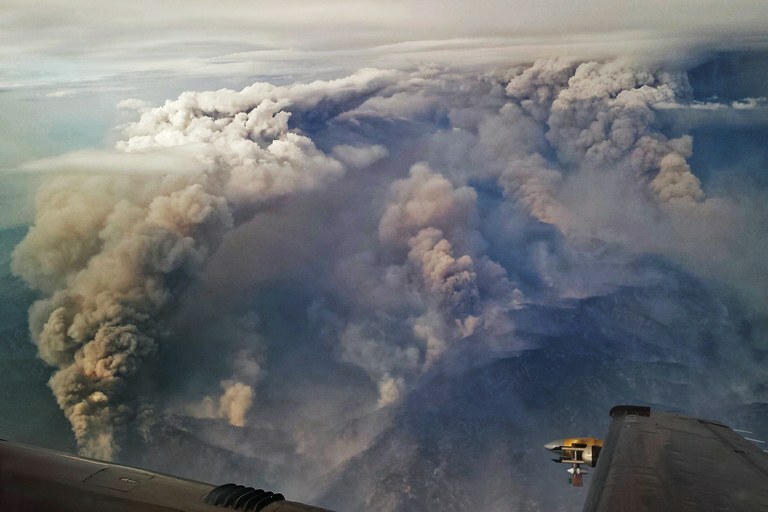 When N2UW flew through the plume of the Pioneer Fire in 2016, its instruments registered updrafts of 80 to 100 miles per hour. Yet at that elevation, 8,000 feet above the flames, the interior of the plume was only 3 to 6 degrees Fahrenheit warmer than the surrounding air, meaning that its buoyant stampede through the atmosphere was powered by a density difference of just about 1 percent. 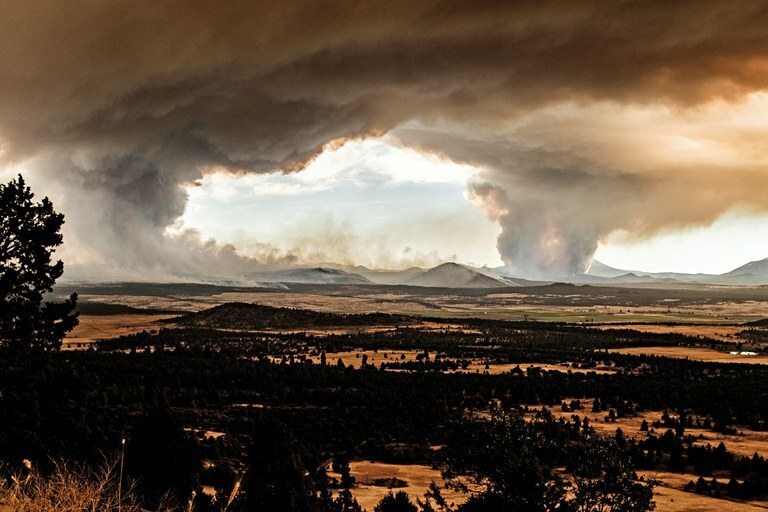 In other words, given the right atmospheric conditions, a few degrees of warmth and extra buoyancy could spell the difference between a plume that pushes 40,000 feet up, into the stratosphere, powering a vicious blaze on the ground — as Pioneer did — and one whose smoke never escapes the top of the boundary layer at 3,000 feet, leaving the fire stunted, like a weather-beaten dwarf tree gasping for life at timberline. N2UW made two more passes through the plume of the Pioneer Fire on Aug. 29. During that third and final pass, static electricity roared through the cockpit radio. Concerned that lightning from the plume might strike the plane, the pilot turned off his antenna. That flight yielded far more than the first direct measurement of a plume’s updraft. Days later, Clements found himself looking at a portrait of the fire’s plume unlike any that has existed before: a vertical MRI slice of sorts cut along the path of the plane—captured by its fine-tuned scientific radar, aimed straight down. Simply seeing can be transformative. Not until people saw microbes could they comprehend and fight diseases like malaria – once blamed on foul spirits or miasmas. And not until Earth’s colorless, odorless magnetic field became visible could people appreciate how it shaped the planet’s environment. While the smoke plume of the Pioneer Fire was apparent to the naked eye, the violent forces within it were also deceptively invisible. As the plane first approached it on Aug. 29, the pilot’s standard weather console showed the plume as nothing but a swath of cool blue — a seemingly gentle updraft, with no hint of what lay in wait. A column of smoke rises from the Pioneer Fire in Idaho. 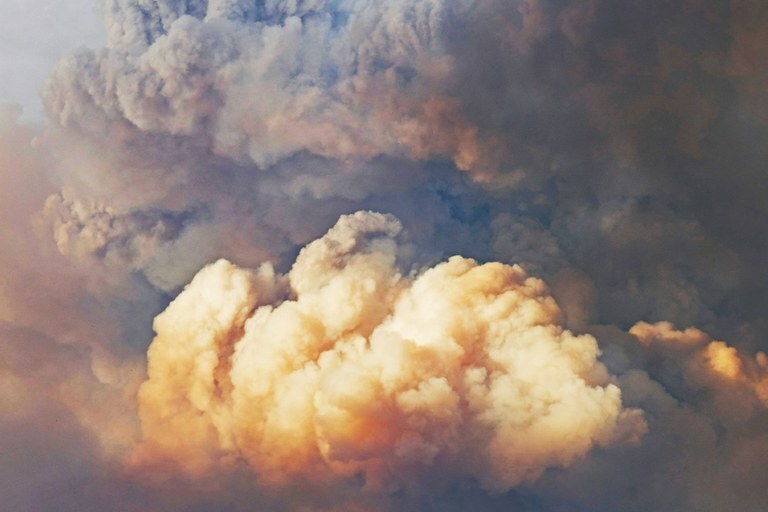 Inside the opaque plume, air moves at gale forces, which can redirect wildfire into unexpected places. Note: This article has been updated to correct a reference to San José State University and the title of Neil Lareau, who is a postdoctoral student, not a PhD student. Douglas Fox is a freelance writer based in Northern California. His stories have appeared in Scientific American, Discover, Nature, Esquire, Virginia Quarterly Review, National Geographic, and The Best American Science and Nature Writing.